Swiss watch exports hit a monthly record when Switzerland's watchmakers exported $1.25 billion of goods in November, up 13% from the same month last year, according to the Swiss watchmaking association. The biggest gains were seen for luxury watches selling for more than $6,000 each, WSJ reports. Switzerland is by far the world's biggest watch exporter in value terms, with exports of nearly $10 billion in 2005 in the $23 billion global watch market. 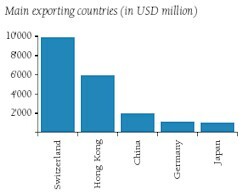 In 2005, Swiss watchmakers accounted for about 9% of Switzerland's total exports. 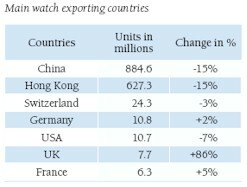 While Hong Kong and China export more watches than Switzerland, they lag far behind in terms of value. Last year, Hong Kong exported watches worth $6 billion and China exported $2 billion, respectively. While the Swiss watch industry is present all over the world and exports nearly 95% of its production. Asia and Oceania take 44% of Swiss watch exports in value, Europe 34%, and Americas 21%. The worldwide watch production is estimated at around 1.2 billion timepieces in 2005. In volume terms, China at 880 million units was the biggest exporter of finished watches in 2005. In second place was Hong Kong with timepiece exports of over 600 million. Ranking first in value terms, Switzerland came third on volume with 24 million timepieces exported.